- 12 foundation piles (right) - build up in suit from Ace to King. 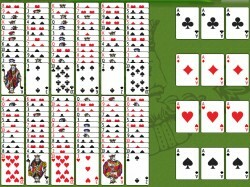 At the start of the game the Aces are dealt here. - 12 tableau piles (left of foundations) - build down regardless of suit. Groups of cards can be moved if they are in sequence down in suit. Spaces may be filled by any available card. At the start of the game 12 cards are dealt face up to each pile. - 4 foundation piles (top right) - build up in suit from Ace to King. At the start of the game the Aces are dealt here. - 8 tableau piles (below foundations) - build down regardless of suit. Only the top card of each pile is available for play. Spaces may be filled by any available card. At the start of the game 6 cards are dealt face up to each pile.